It was quite a shindig. The round of parties included a champagne reception at the home of legendary financial titan, Julian Robertson, founder of the Tiger Fund. The guests enjoyed his hospitality and viewed his extraordinary art collection with its breathtaking view of Central Park. The guests of honor were AFV’s distinguished French Board of Directors: Baron Roland de l’Espée, Le Vicomte de Rohan, Madame Anne-Marie de Ganay, Comtesse Serge de La Bédoyère, Monsieur et Madame Jérôme Fouan, Comte Charles-Louis de Mortemart, Madame Caroline Sarkozy (sister to the French President Sarkozy), Madame Nicole Salinger, and Monsieur and Madame Didier Wirth. Also in attendance was one of our favorite Texans, Houston-based Sir Mark Haukohl. Other benefit visits included a luncheon at the historical landmark andillustrious “21 Club”, founded in 1929, along with a cocktail 'dinatoire' at the home of the world-renowned interior designers, Juan Pablo and Pilar Molyneux, both AFV board members. The seven story townhouse with a rooftop swimming pool welcomed guests of honor Mr. Julian Robertson, Mr. and Mrs. Steven Rockefeller and Madame Caroline Sarkozy. Also included was a lunch at Cafe Boulud owned by chef Daniel Boulud, and a farewell reception dinner at the home of AFV’s International Council members, Margaret and Gregory Hedberg (extraordinary fine art aficionado) - the Hedbergs have assembled a fantastic, eclectic and phenomenal art collection. The goals of the American Friends of Versailles ARE many that include heightening the awareness of Versailles within the United States, to enhance the important French /American Friendship, to support the restoration and preservation of Versailles for future generations. AFV’s goals have been realized in the restoration and recreation of the Trois Fontaines Bosquet and the Pavillon Frais - two magnificent and historical gardens, which will be enjoyed by many for years to come. In these challenging financial times, the American Friends of Versailles seeks not only to preserve Versailles, by supporting projects that would not be accomplished without private funding, but seriously to promote the French American Friendship as well as International Friendship. It comes together in the civic and cultural arenas exchanging a myriad of ideas. As we all know, Versailles is steeped in history and has extraordinary roots in the United States. 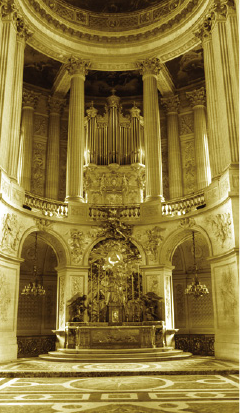 In addition to its restoration projects, the American Friends of Versailles has donated to research projects and computer systems, restoration of the trees at Versailles, photo exhibitions in the USA and international cultural seminars. Other distinguished New York hosts, who have generously received The American Friends of Versailles, in the past include: The Forbes Family, Anne Bass, Ambassador and Mrs. Felix Rohatyns, the Henry Kissingers, Susan and John Gutfreund, Kathy and Bill Rayner, Catharine and David Hamilton, Kimberly and Steven Rockefeller, Mrs. Samuel Lefrak, Francine Lefrak, and Rick Friedberg, Betsy and Larry Blau, Elizabeth and Henry Segerstrom, Liz Fondaras, the Guest Family, Duane Hampton, Margaret and Gregory Hedberg, the French Embassy, the French Consulate, the Metropolitan Museum courtesy of Jane Wrightsman, the Central Park Conservancy, the New York Botanical Gardens.